Thailand is an amazing country filled with historical wonders, gorgeous temples, amazing food, friendly people and so much culture! 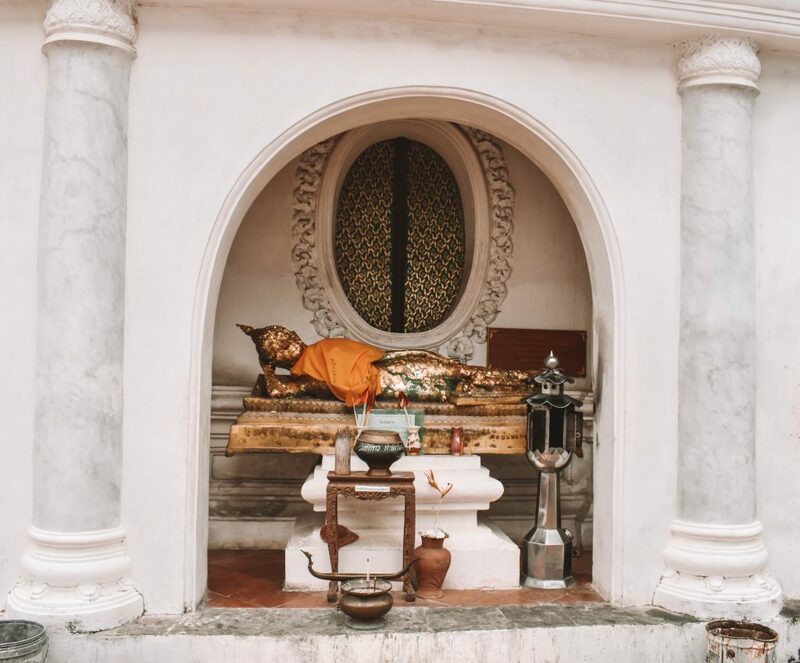 Back in July 2017, I traveled to Thailand where I was immersed in some of the most unforgettable adventures I’ve participated in and visited the most beautiful sites that are authentic and sacred to Thai culture. During my two weeks in Thailand, I traveled with a group where we visited the cities of Bangkok, Damnoen Saduak, Phitsanulok, Chiang Mai and the island of Koh Samet. 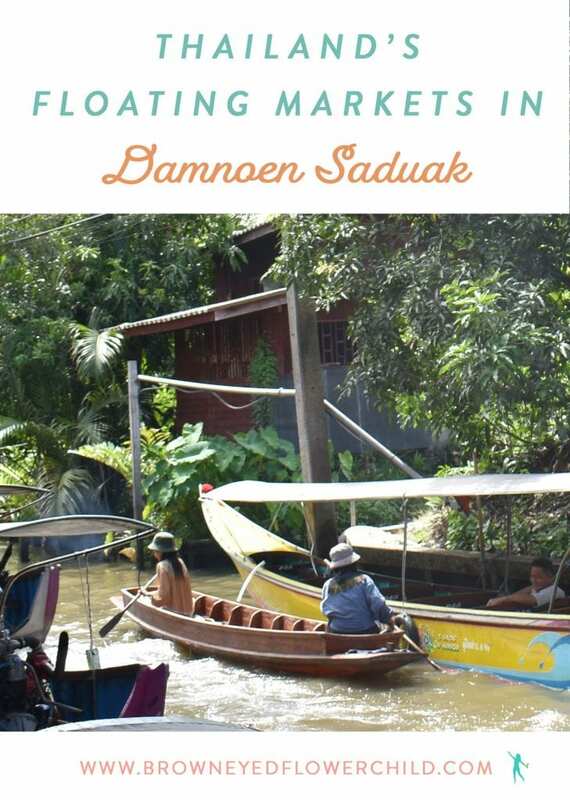 In this blog post, discover everthing you must see and do when you visit the floating markets in Damnoen Saduak. Since I did a group tour to Thailand, all of my flights and hotels were taken care of beforehand. What I highly recommend you do is set your desired travel dates into Skyscanner ahead of time and wait to see when the prices are low enough to purchase. I flew from Newark Airport to Suvarnabhumi Airport in Bangkok with a 3-hour layover in Hong Kong. It took us 16 hours to get from Newark to Hong Kong and then another 2.5 – 3 hour flight to Bangkok. It is fairly easy to get around Thailand. Since I was with a group, we traveled around via private coach, but the country is filled with railroads. Most locals recommend you travel via train as it offers a safer and more comforting experience. Other ways to get around is by taking the bus, ferry, local transportation or renting a car. 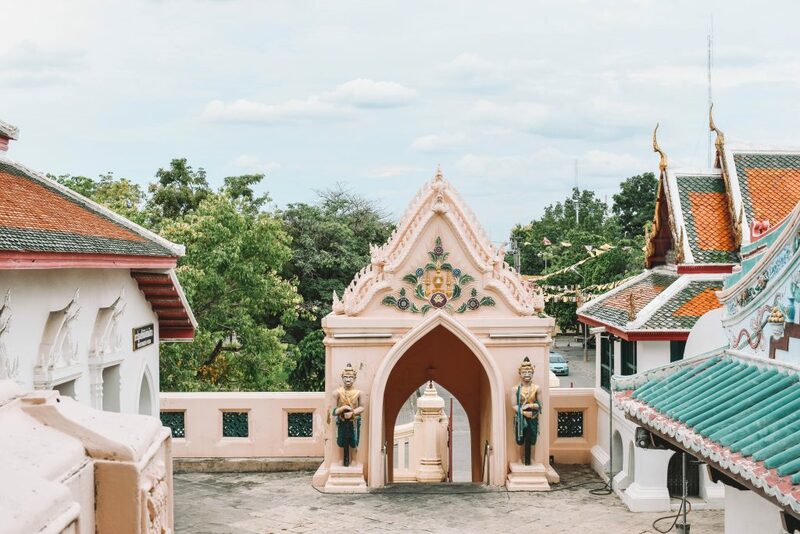 Click here to discover the best ways to travel around Thailand. Since the floating markets in Damnoen Saduak are only an hour away from Bangkok, I highly recommend staying in the city and doing a day trip to the markets and surrounding area. 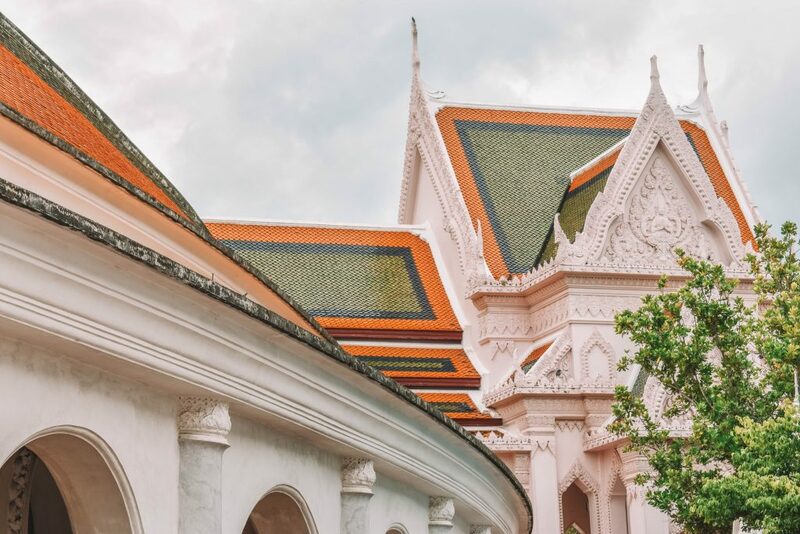 Click here to read my blog post on what you must do in Bangkok. During my time in Bangkok, I stayed at Furama Silom located in Silom – Thailand’s major financial center and entertainment hub. This urban hotel offers a great Thai breakfast, has a rooftop pool, contemporary interior and friendly staff. You could find other great hotels in Bangkok on Expedia. 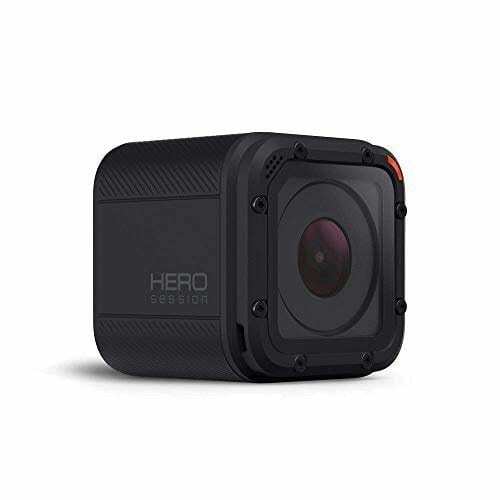 There are also a wide range of Airbnb options and with a growing number of nomads living in Thailand, there is a wide range of hostels as well. On our way to Damnoen Saduak, we passed land that looked like typical rice paddies. I was informed that they were actually salt fields instead! One of the cool things I learned was that most of the salts we use for cooking come from these fields outside of the Bangkok area! It usually takes around one month to produce the salt. 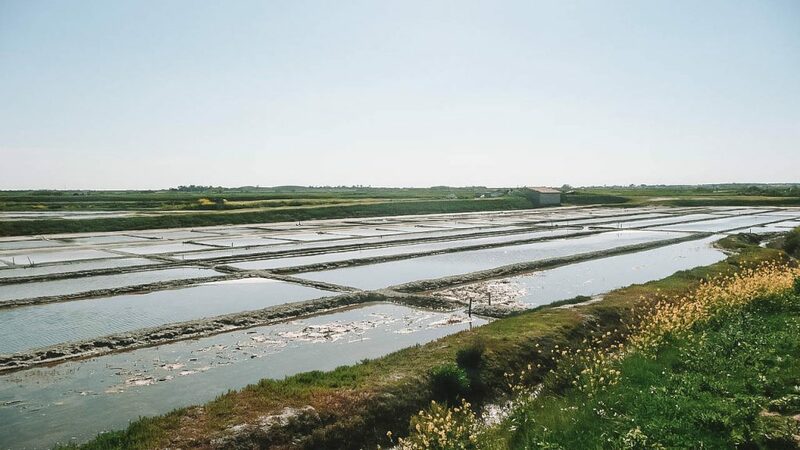 As you probably have wondered, it takes a lot of hard work and effort to make salt. The prepared fields are manually flooded with water from the Gulf of Thailand and are left to dry naturally in the sun. When the water has eventually evaporated, the salt is then piled, cleaned and bagged for sale. How awesome is that? Our first main stop of the day was to the Coconut Sugar Farm in Samut Songkhram. Coconut is a popular fruit in Southeast Asia and they come from the coconut flowering tree that looks like a regular palm tree. 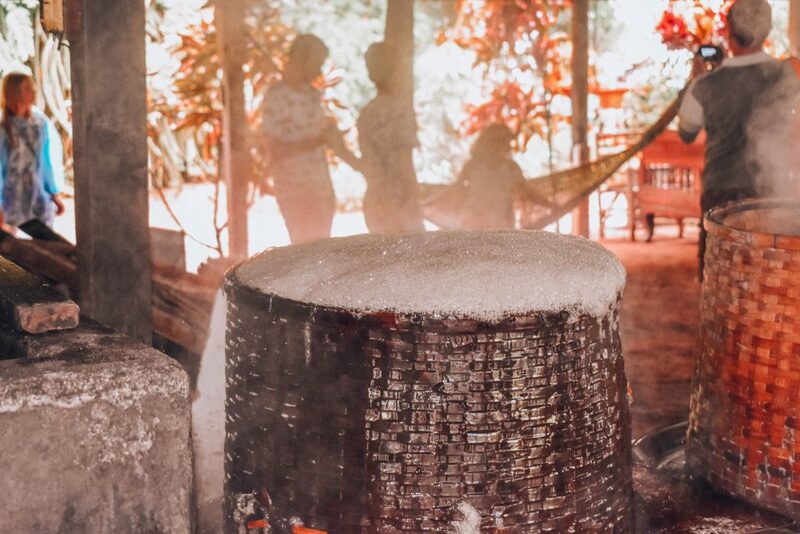 Coconut sugar is also found at this tropical farm and it is a popular and healthy alternative to the typical white sugar we are used to baking with in the United States. Just like salt, the process to make the sugar requires a lot of hard work and manual labor. The sap from the coconut trees is collected and placed into a basket. They are then poured into hard metal pans so that the sap from the trees can boil into a caramel-like texture. Once the sap becomes hard, it then crystallizes and is ready to be used for cooking. I had so much fun helping mix the sap! 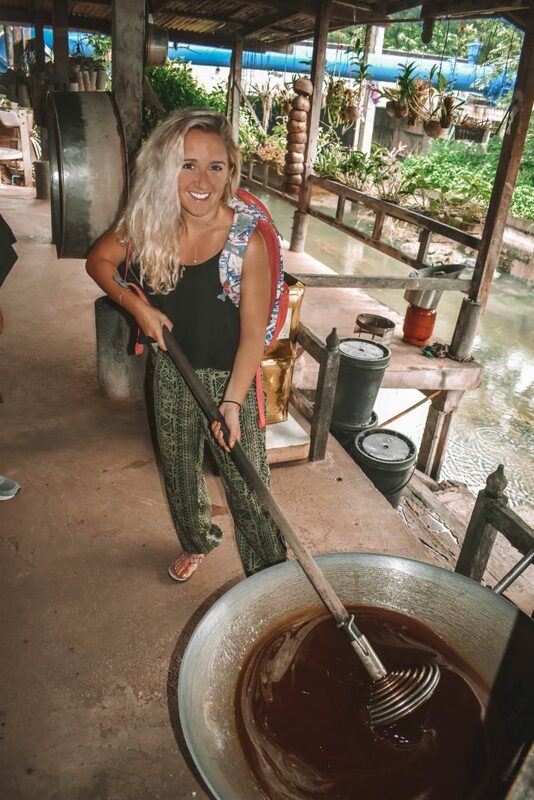 I give the owners and workers at Coconut Sugar Farm a lot of credit because my arms easily tired out after a few minutes of mixing the sap. Afterwards, I was able to cool off with a refreshing and tasty coconut! I was so excited as this was my first time ever drinking out of a real coconut. Once I finished, I couldn’t help myself but eat all of the coconut cream left over. The farm had hammocks and rocking chairs to lounge, relax and enjoy the delicious fruits. After our time at the Coconut Sugar Farm in Samut Songkhram, we got back on the bus and headed straight to the world-famous Thai floating market in Damnoen Saduak. 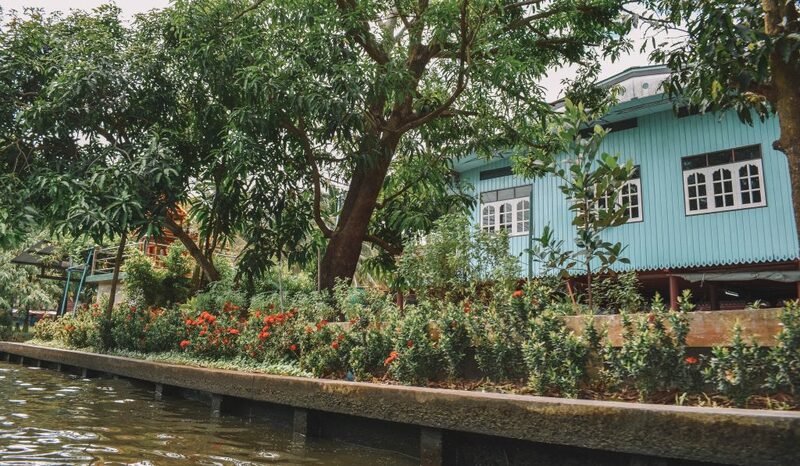 When we arrived, we hopped onboard a long tail speedboat that took us through the jungle and into the canals of the world’s largest floating market. 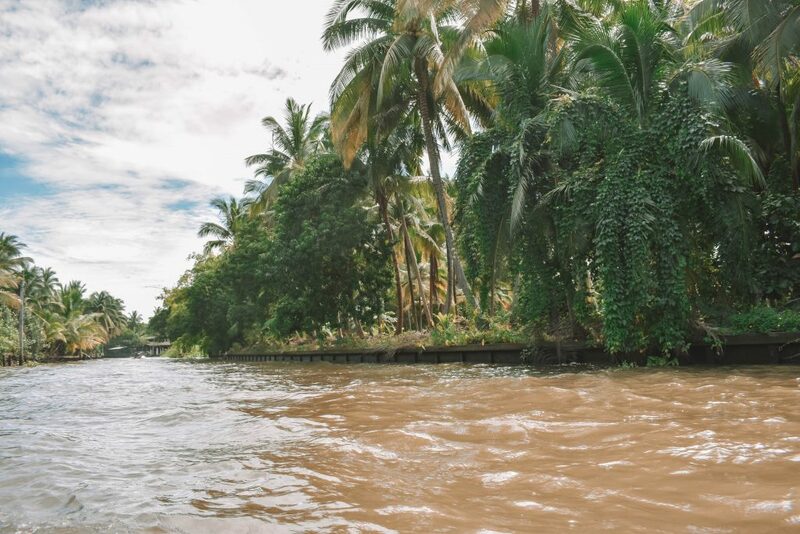 We had a blast cruising through the water, but we got a little freaked out when we were told to keep our hands in the boat because of the anacondas and crocodiles living in the channels. Even though the boat was going fast, it was so low to the water that anything could’ve jumped out! It was such a fun experience and we had a lot of great laughs out of it. We passed traditional Thai houses, natural jungle that usually featured a shrine or gold Buddha within it and we also saw tropical birds flying through the trees. 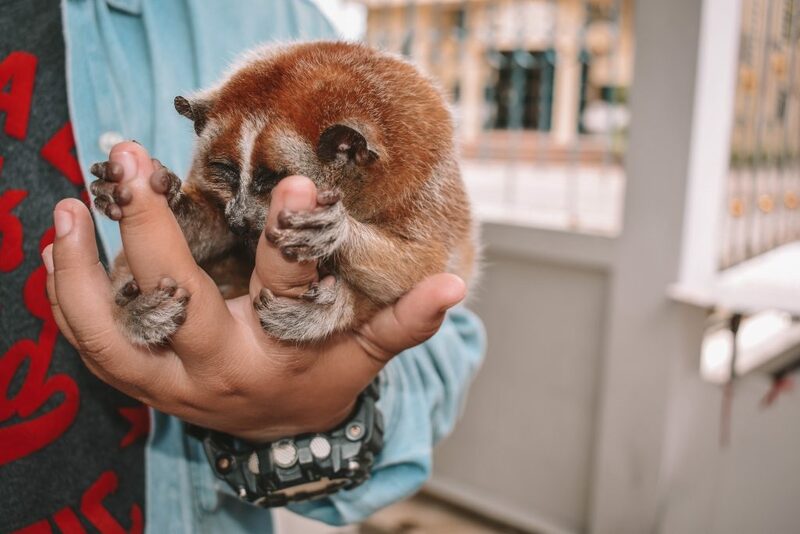 At the floating market, you can purchase gifts straight from other long tail boats or you can ask your driver to pull up to a vendor you are looking to shop at. It is an awesome and authentic concept! We were able to park our boats and walk around the market as well. The elephant is the sacred and royal symbol for Thailand and elephant pants are the “official uniform” for women and men traveling through Southeast Asia. These beautiful patterned pants are worn loosely and make for a Bohemian look. 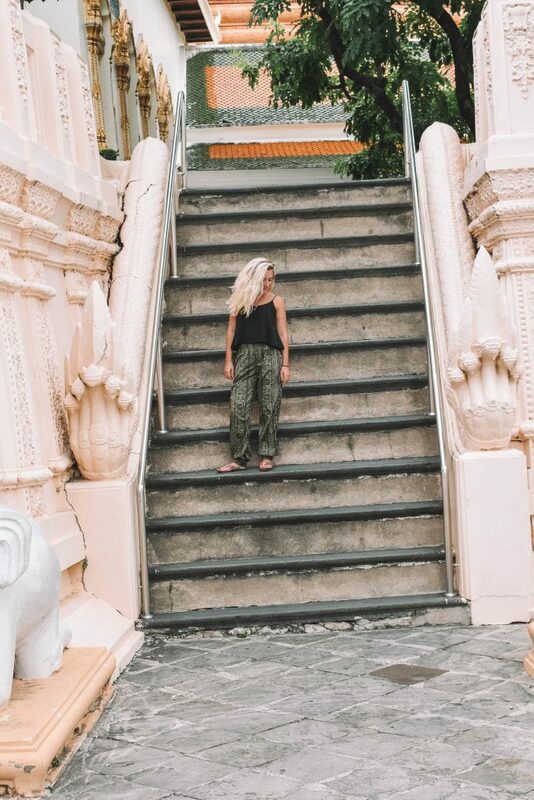 Since there are strict dress codes for many of the temples and palaces in Thailand, elephant pants work perfectly. 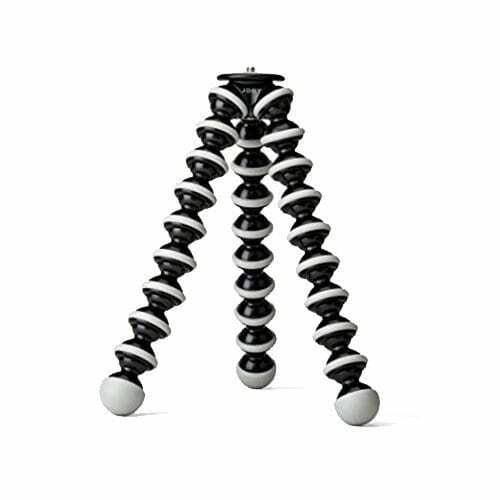 They are even light enough for the humid Thai weather in the mainland and ocean breeze on the islands. In the United States, you can purchase elephant pants online at The Elephant Pants (as seen on Shark Tank) while donating money to save the elephants. At the floating markets, as well as all of the other markets in Thailand, you can find a pair of pants for all shapes and sizes. 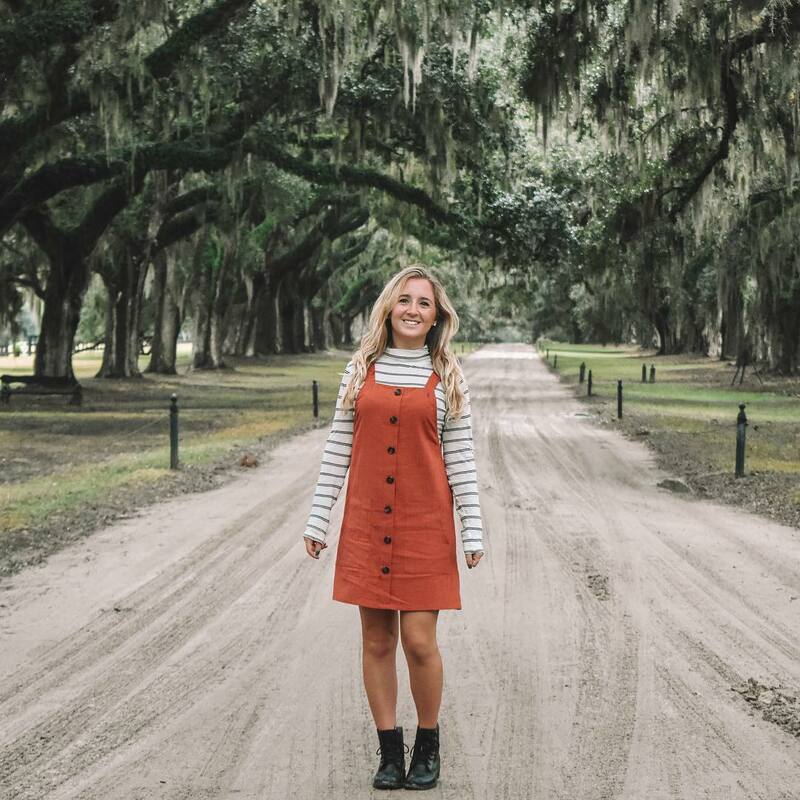 In addition, you can even purchase elephant shorts, dresses, skirts, rompers, jumpsuits, shirts and more! In addition to elephant pants, you can also purchase elephant figurines, key chains, coffee mugs and more as well as jewelry, paintings, handcrafted household items, purses and wooden knifes. One thing to keep in mind when you visit the floating market during your time in Thailand is that you are falling into a tourist trap. 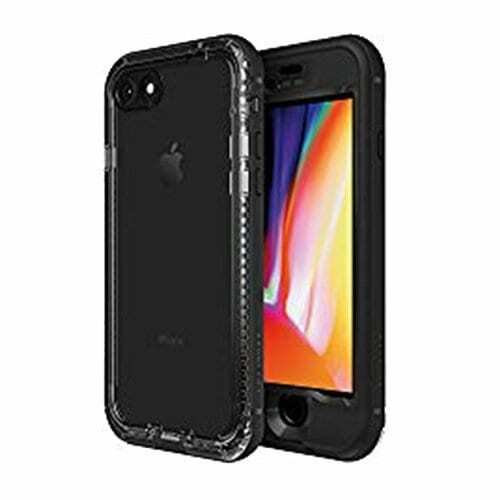 All of the items being sold are much more expensive than if you were to buy them at a smaller market in a different city. 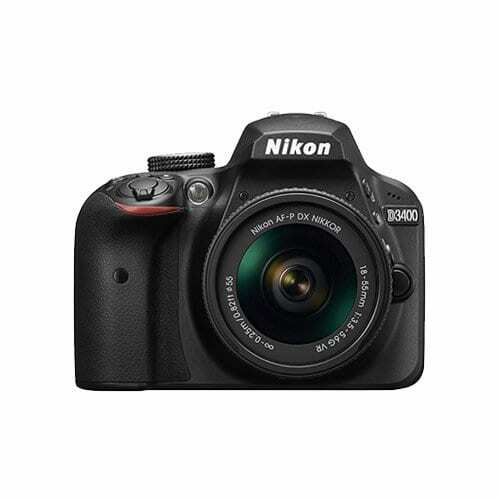 You can, however, test your negotiation skills with the vendors since they never want to miss out on a sale. The food sold at the floating market is also amazing! 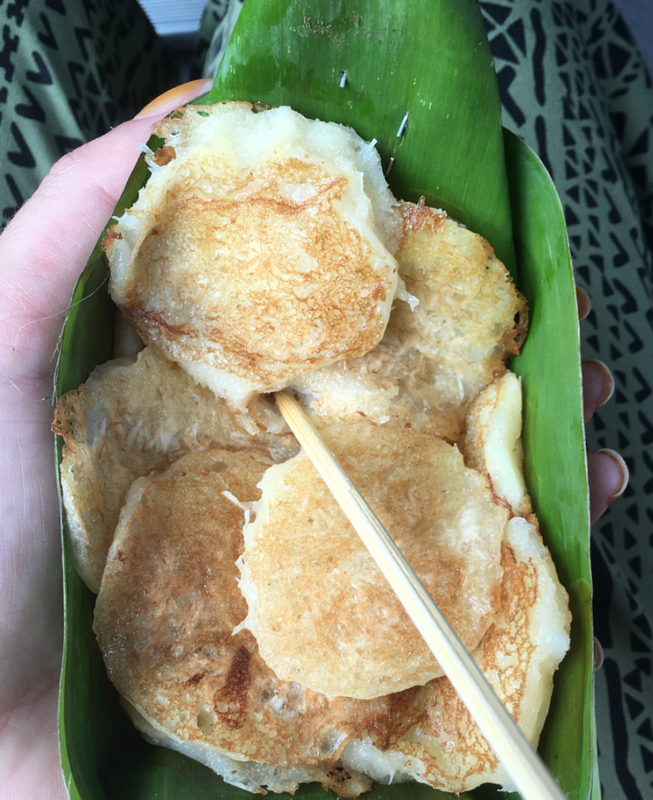 You can purchase coconut ice cream, barbecue chicken, coconut and banana pancakes (pictured above), green tea chips and fresh fruit such as pineapple, bananas, dragon fruit, purple mangosteen, durian and mango. The fruit in Thailand is fresh and so delicious. 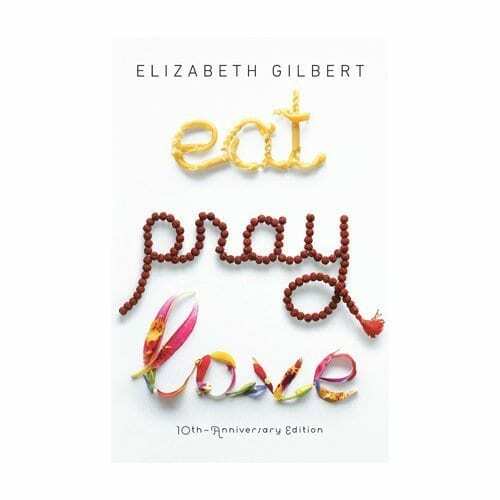 I ate it with almost every meal during my two weeks there. 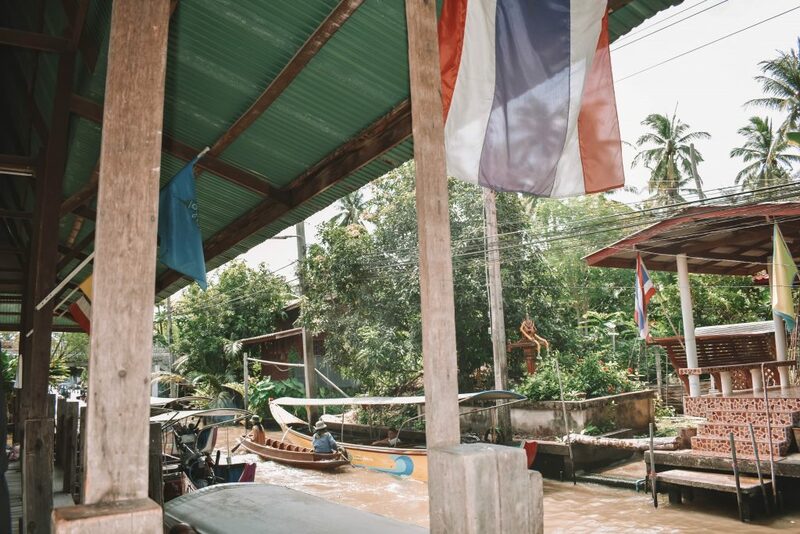 The Damnoen Saduak floating market is huge and you can find almost everything there! It was definitely one of the most memorable experiences during my time in Thailand. 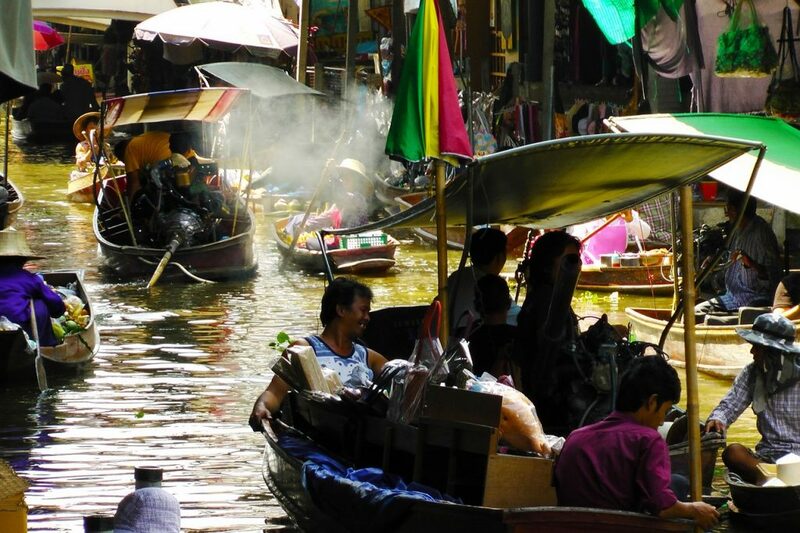 Click here to discover more floating markets in Thailand. After our shopping spree, we drove 45 minutes north to Wat Phra Pathom Chedi featuring the tallest Buddha shrine in the world. 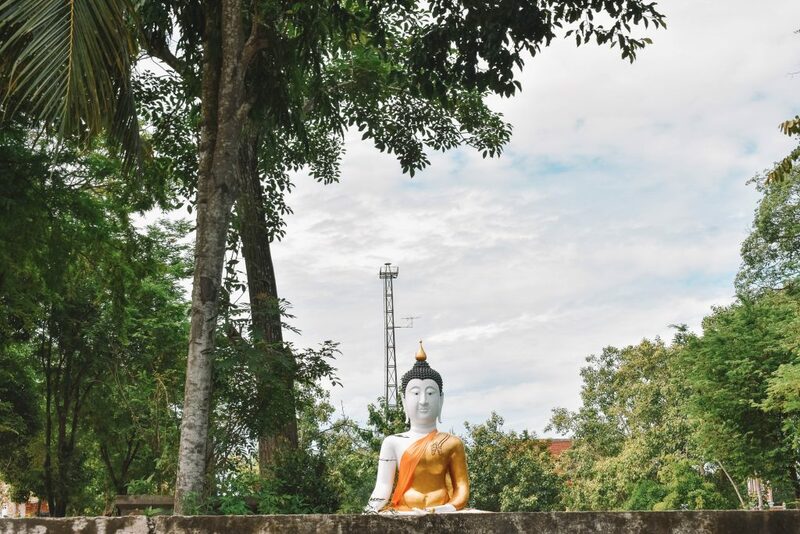 This 416-foot Buddha stands on the site where Buddhism was first introduced into Thailand over 2,000 years ago. 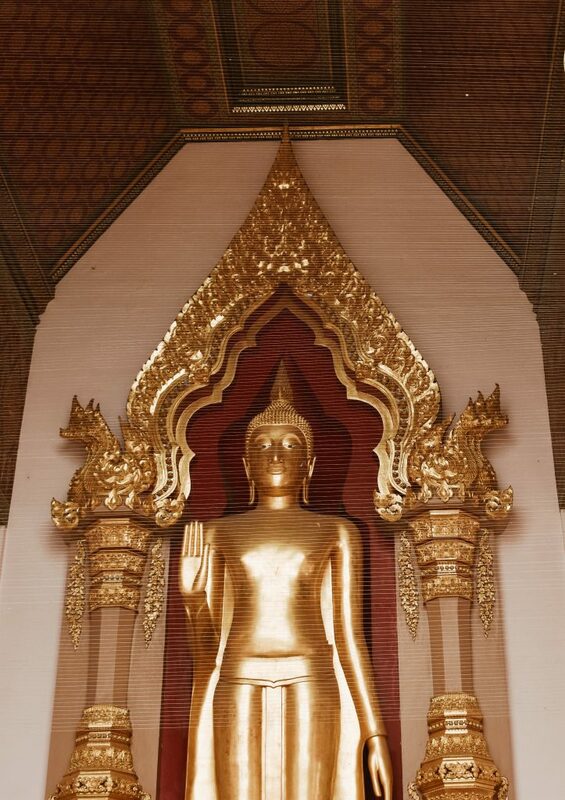 During our time at Phra Pathom Chedi, we got to witness several religious ceremonies with Buddhist monks. We even got to walk around and explore the many other golden shrines and intricate architecture. We ended our tour of Phra Pathom Chedi by exploring the small caves and surrounding area. Visiting this historical and sacred site was a great way of ending our time in the Bangkok area. 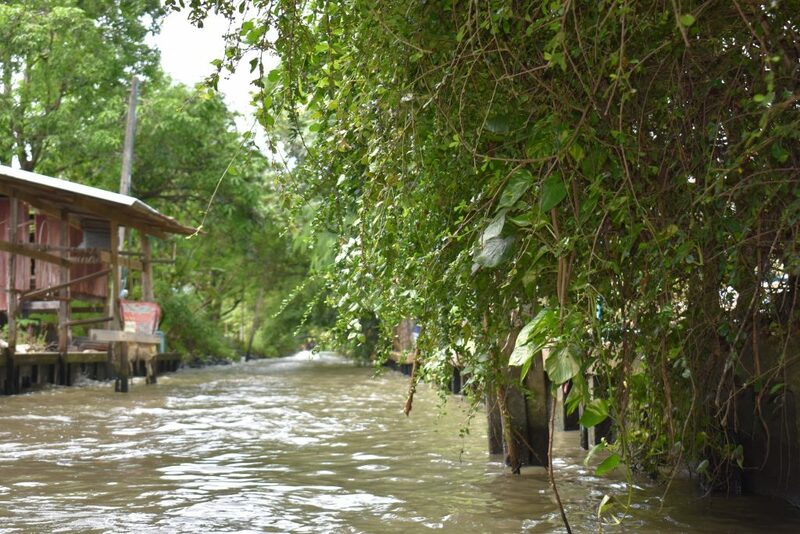 I hope you all enjoyed reading about my time at the floating markets in Damnoen Saduak, Thailand and discovering the best things to see and do during your time in that area. 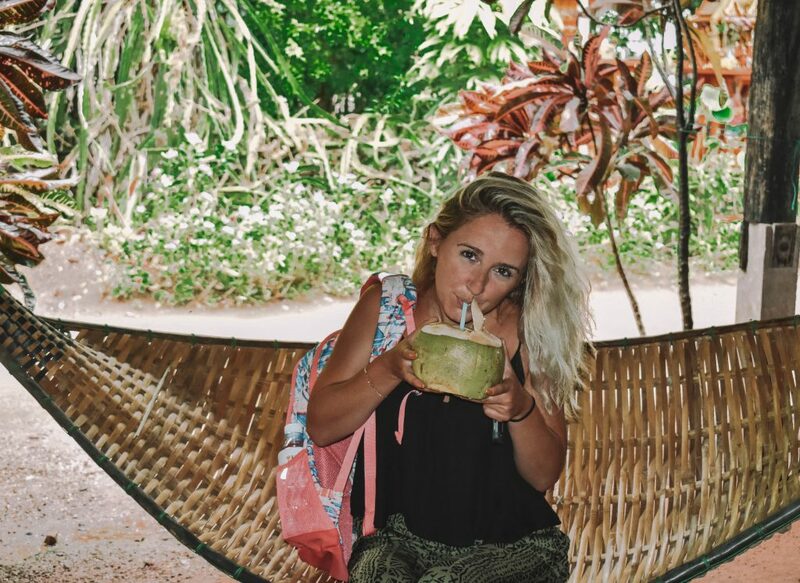 If you have any questions about my time at the floating markets or my trip to Thailand in general, please feel free to email me at info@browneyedflowerchild.com, contact me via social media or leave a comment below.